MyCRM Blog | MyACTIVITYCalendar Blog 1: Discover how to get ahead of the game with different activity views! ← What is happening to the world of CRM? Another week and another great productivity enhancement from MyCRM to showcase. What’s more MyACTIVITYCalendar has now been further enhanced to deliver even greater business value than ever before. So let’s start with the answer to the fundamental question so often asked, this is; “why do we need MyACTIVITYCalendar”. 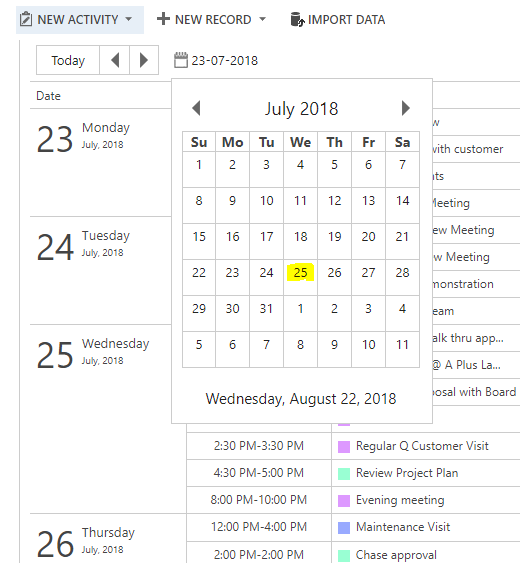 I guess for experienced users of Dynamics 365, the answer itself becomes obvious once challenged by the desire to see activities for users or teams of users, in one single calendar view. The simple fact is you can’t achieve this using Dynamics 365, and no amount of ‘tweaking’ Outlook using integration is going to achieve this either. So when it comes to the need to want to manage teams and individuals, by fully understanding what they are involved in from an activity point of view, you need MyACTIVITYCalendar. If on the other hand you’re more focused on activities relating to specific Dynamics 365 entities, e.g. Opportunities or Cases, or any custom entity for that matter, you also need MyACTIVITYCalendar. MyACTIVITYCalendar provides calendar views that users need. Much in the same way most of us users of Outlook operate, switching from daily views and schedule views to look ahead across a week or even a month, MyACTIVITYCalendar offers the same viewing flexibility. In fact, it goes one better than Outlook by allowing users to select a 3 month/quarterly view in addition to scheduled agenda, daily, weekly and monthly viewing. So if your focus is 30-60-90, you’ll be pleased to see that this timeframe can be clearly seen and focused on. It is simple to switch views using the control as shown below. The Agenda view is ideal for providing a ‘heads up’ for the coming week’s schedule, and maybe a quick print out, if like me (old school), you may still like to arm yourself with paper – just in case your laptop, tablet or mobile running Dynamics 365 isn’t to hand. The agenda view’s schedule date range can be easily navigated using the left and right arrows or by selecting a specific date from the calendar lookup as seen below. Next up comes the Daily view, everything in your day is clearly evident and colour coded according to the activity type. Colour coding preferences are set during the configuration of the calendar views. In the Weekly View users can now see all the activities across the week, again using the same colour coding. Activities can be re-scheduled using ‘drag and drop’ but we’ll be covering this aspect off later this week in a further blog. In the Monthly View we can really start to gain an appreciation for the level of activities that are being conducted throughout the month. It is easy to spot gaps in schedules and where activities may be clashing. Finally, we see the Quarterly View spanning across the 3 months. This is particularly useful to help plan ahead, and for those engaged in 30-60-90-day planning, is exactly what is needed to support such activity. The most important thing to consider when viewing activities is to ensure that users are given the choice to view things in a way that suits them best. Being able to easily switch views is important, as is being able to quickly identify activity types based on a preferred colour coding. MyACTIVITYCalendar is a great productivity enhancement for Dynamics 365 making it easy to plan and understand and schedule activities more efficiently. In the next blog we’ll take a look at how easy it is to view activities against specific Dynamics 365 entities, specifically covering Sales Opportunities and Cases.